During extreme weather changes, my skin produces lovely dry patches that even the most subtle makeup draws attention to — ugh. So, I make a point to exfoliate every few days, depending on what I think my skin needs. Whether it’s manual or acid-based, exfoliation is something I pay extra attention to this time of year. While I’m still discovering some favorite acid-based exfoliators, today I’m sharing the manual scrubbers I’ve tried over the years — both the ones I like and the ones I’ll pass on. Deep green in color straight out of the tube, Acure Organics Brightening Facial Scrub transforms into a punchy mint green speckled with scrubbers when mixed with water, creating a slight foam that allows the scrub to nicely slip across the skin. I love the green sea monster look and gentle-yet-dense scrubbers in this formula. It’s a staple in my exfoliation arsenal and one that I’ve recommended time and again to friends. Packed with 13 active ingredients, Blissoma’s “Glow” exfoliant brings sluggish, lackluster skin back to life. This preservative-free, powdered vitamin C skin treatment contains only the best herbs, grains, clays, fruit enzymes and more to deeply clean and brighten your skin. The texture is perfect, and I admire founder Julie Longyear’s dedication to bringing affordable, luxurious herbal skincare to us all. This exfoliating cleanser and mask gets everything right. Ingredients. Scent. Texture. PRICE! Made with a combination of clays, oats, flowers, seeds, enzymes and oils, Brown Butter Beauty’s Green Lady Mask Exfoliating Treatment is an absolute steal. The scrub texture is never too gritty or scratchy; instead, it’s a soft scrub enveloped in comforting clays that help purify skin while the ground ingredients get to work exfoliating and brightening. A soft scent of lavender and carrot seed oil keeps it floral and beautiful while green and kaolin clays give it some density. This is an utterly perfect exfoliating mask. You had me at Banana Bread Pudding. Rice powder, milk powder, banana and fine oat flour make this ultra satisfying facial scrub a delicious skin treat. The fine, gentle texture works well on any skin type. While you should always be very careful using scrubs on active acne, this scrub never irritated my breakouts, and helped slough off the dead skin post-healing. Made with just four ingredients — one of them being the stinky Adzuki bean — this natural facial scrub won me over. Somehow, likely thanks to rose petal powder, this bean-based exfoliant smells wonderful and feels perfectly fine and gritty on the skin. It’s gentle, but still delivers a satisfying, skin-softening scrub. I like mixing this dry scrub with oil for a silky massage. I was pleasantly surprised by this concentrated facial scrub made with oats, herbs, minerals and honey. The base, made with Fuller’s earth clay, makes this scrub almost mask-like. But, the fine texture secures it firmly in the scrub section … and might I add, is on my absolute faves list. If you grew up loving a very famous apricot scrub, you’ll fall hard for Flight Skincare’s Soft White Gentle Face Polish. The soft, gritty texture of this scrub reminded me so much of that former favorite from decades past. Made with walnut and jojoba for a smoothing exfoliation job, this face polish is gentle enough to use every day. True to its name, frank body’s Creamy Face Scrub offers a generous amount of thick, comforting cream and tiny, coffee powder scrubbers for a jolt of energy and exfoliation during your morning shower. This face scrub features an extremely fine grind that sloughs away dry, flaky skin to reveal something more supple and soft. It’s a joy to use thanks to its comforting texture, and for coffee lovers, it’s a no-brainer. Another cup of scrub, please! Now this is a luxurious skin treat: Goldenfaden MD’s Doctor’s Scrub Advanced is made with ruby crystals for the most intense exfoliation you’ve ever experienced. A small amount (think dime-sized) is more than enough for your face and neck. Add water or even a cream cleanser to help spread the crystals more for a truly deep-down exfoliation. The scrub foams just a bit as you massage it in, but I wouldn’t call it a “foaming” exfoliant. Just a very interesting formula all around! In addition to ruby crystals, red tea and seaweed extracts help brighten and soften skin while hyaluronic acid adds moisture. I’m very obsessed with this formula and texture, but save it for when my skin needs intense exfoliation. A little definitely goes a long way! I’d recommend HANA Organic Skincare’s Lavender Grains to anyone with overly sensitive skin that would benefit from a super-gently exfoliator. The natural scrubbers in this mixture are extremely gentle and spread-apart in the scrubbing process (does that make sense? ), so you don’t get this intense, dense, sandpaper feeling like you can with other scrubs. Plus, it doubles as a mask and smells lovely. This luxurious treatment doubles as a mask to brighten, soften and exfoliate your skin. In true Josh Rosebrook fashion, a combination of potent plant, herb and fruit enzymes slough off dead skin cells to reveal new fresh, radiant skin. Made with nutrient-dense plant oils and raw honey, Josh Rosebrook’s Active Enzyme Exfoliator is the perfect spa-at-home treat for your face. My friends who transition to cleaner beauty usually find Lush at some point. While not exactly the cleanest brand (many Lush products contain parabens), there are a few products in the collection that are better formulated. One is Angels On Bare Skin, which is marketed as a face and body cleanser, but something that I’d classify as a gentle face and body exfoliant. Made with ground almonds, glycerin, kaolin clay, lavender, rose and chamomile, this gently facial exfoliant feels mushy with some light grit. You can use it as a cleanser and mask, but I like it best as a thick exfoliator, and really like the feeling of moving around the gentle lavender buds. This delicious mud pie is a spicy blend of cleansing clays that smell of nutmeg, clove and cinnamon. It instantly evokes memories of baked goodies and home upon first sniff of the dry powder. Upon mixing the powder with a few drops of water, the fragrance intensifies and the powder transforms into a bubbling, foaming mousse. You can feel soft yet gritty little scrubbers as you massage “The Clean Dirt” on your face — you can likely thank the healing salts for this exfoliation. This has been a favorite of mine for quite a while, and I love it even more in the fall and winter because of its yummy, spicy scent. Though I’m a fan of sandalwood, I was a little skeptical of this exfoliating cleanser. Sandalwood is one of those scents that can be overpowering if it’s not blended well. Leave it to Mullein & Sparrow to find the perfect way to marry a variery of flours with sandalwood, turmeric, orange peel and rose geranium for a woody, floral blend that’s especially comforting. I was impressed that this exfoliating cleanser combines oat and chickpea flour, yet never feels overly mushy. It has a lovely grit (thansk to walnut shell powder) that makes my skin look and feel bright and refreshed. With just two simple ingredients, Napa Organics’ Prune & Walnut Gentle Exfoliant is an interesting, dry formula that never feels mushy or harsh, yet delivers a very satisfying, gentle scrub. This exfoliant can be used on its own with water or mixed in with your favorite oil or oil cleanser for a wonderful experience. The walnut and prunes are finely ground and never itchy-feeling. This exfoliant is also extremely affordable and different than most dry scrubs that have a base of oats. An impressive, inexpensive formulation, Now Solutions’ Nature’s Microdermabrasion is one that I constantly reach for in the shower. It’s formulated with volcanic sand for a natural yet aggressive exfoliation. The fine grit slides gently across wet skin for a satisfying scrub that is never too harsh. 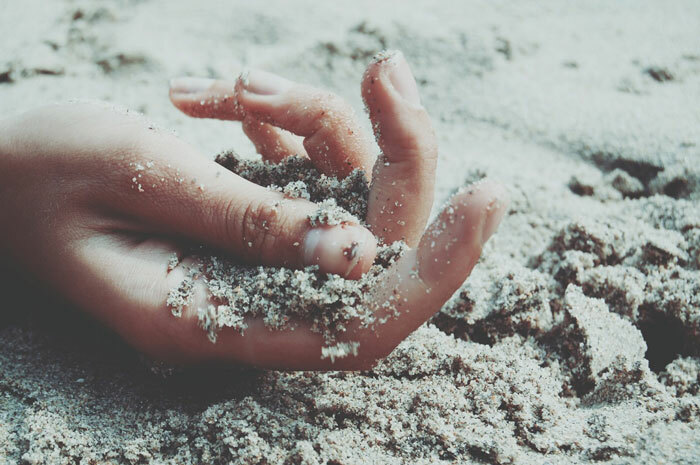 In combination with vitamin C, volcanic sand helps brighten the skin while refining its texture. The addition of vegetable squalane, extra virgin olive oil and avocado oil add a layer of light moisture and extra protection to the skin during the exfoliation process. Designed to be custom-mixed per application, this dry formula from One Love Organics is a classic in the world of cleaner exfoliators. Brand New Day offers a super-fine texture thanks to organic sweet pea flour, pineapple enzymes and kaolin clay. This smart combination helps remove impurities and smooth the skin. I’ve had the pleasure of having Brand New Day used on my face at my spa and being once again reminded why One Love Organics has seen such success — it’s simple yet luxurious and works so well at softening the skin! Leave it to Osmia to make normally stinky adzuki bean exfoliants smell good. The combination of sandalwood and lavender make this bean-and-grain facial scrub pleasant to sniff during your evening scrub. It can also be doubled as a mask (as most of these products can), and is a joy to use. It’s so gentle! At first glance, I didn’t think I would like this product. In the jar, River Veda’s exfoliant looks like corn starch. (This dry exfoliant is actually made of organic rice granules.) On the skin, it feels like the most finely milled, gently exfoliating grains you’ve ever experienced. It doesn’t have much of a scent, though it contains oils of pomegranate, calendular and rose geranium. But what it does have? My soft-skin seal of approval. Made with just three ingredients, S.W. Basics of Brooklyn’s Exfoliant is a simple yet effective skin scrub that feels good and smells clean. I love the snarky tagline on the packaging: “Sorry, no plastic microbead technology inside, oops.” Adina, you’re a badass. Thesis wins for most beautiful label art — but it’s what’s on the inside that counts, and Thesis does not disappoint. This gently scrub contains poppy seeds, which offer a very soft exfoliation that gets the job done without causing tiny tears in the skin. The combination of clays, seeds and mild herbs make this exfoliant gently detoxifying. I like using this scrub as a mask to reap all the ingredients’ skin benefits. This gentle cleansing, exfoliating powder is made with finely ground bamboo and rice polish for a soft, satisfying scrub. While this powder blend contains adzuki bean powder, notoriously stinky, the smart combination of rose petal and sandalwood powder beautifies the scent. It’s feminine and pleasant, and the minimalist glass bottle and white label make it a pretty addition to your bathroom vanity. Probably more suitable for ultra-sensitive skin, Brittanie’s Thyme Facial Scrub felt too mushy and oatmeal-like for my skin. While I know we don’t need to be scrub, scrub, scrubbing away until we’re red in the face, this organic facial scrub didn’t provide the level of grit that I expect with a bi-weekly exfoliating treatment. Same great texture as the Banana Bread Pudding scrub in my “repurchase” list, but the scent of this one … no. Just no. Not sure how you mess up vanilla, but seriously. Maybe a bad batch? The scrub did a nice job of deep-cleaning my pores thanks to activated charcoal and seaweed, but had a bit too much of a scent for my liking (kind of minty). I’d use it again in a pinch if I had to, but it’s not my No. 1 choice. I wanted to like this scrub because of its creamy, clay-rich formula, but I found that the exfoliating power in it (led by jojoba esters) was not enough for what I felt my skin needed. I instead used this as more of a gently exfoliating mask. If you have more dry / combination skin, you might like this better, as it’s creamy and very gentle. If you’re not an earthy / herbal scent kind of person, this probably isn’t for you. Beyond the scent, which I know is very personal for everyone, the texture of Meow Meow Tweet’s Face Exfoliant is extremely gentle. The natural oats and walnuts don’t overstimulate your skin, yet are enough to reawaken your glow and prep your skin for your favorite toner and face oil. This is another one that I would use in a pinch thanks to its addicting scent (bright orange! ), but I felt that it wasn’t quite the level of exfoliation that I crave. This is an extremely gentle facial exfoliant designed for combination skin and has noticeably more “creaminess” than “scrubbiness.” If you have combination / dry skin, check this one out, as it’s in a base of aloe vera and is very soothing. I just like a bit more ooomph in my exfoliator. Made with tiny, pure jojoba beads, this exfoliant is housed in a concoction of aloe vera, coconut oil and vegetable glycerin that gives it a creamy yet runny texture. Perhaps you can chalk it up to “user error,” but I find that the tiny little jojoba beads are difficult to rinse away when used outside of the shower. It’s like sand — you find the beads in the weirdest places even though you thought you washed it all away! Another one more suitable for ultra-sensitive skin, Province Apothecary’s exfoliator didn’t deliver the level of grit I desire during the exfoliation process. While I enjoyed using this gentle exfoliant, I found the inclusion of Himalayan Pink Salt a bit irritating. If you have any active acne, this will likely be the case for you, too. Though it’s gentle and full of vitamin and antioxidants, this face polish from Sweet Leaf Bath Co. doesn’t please my nose. Anything made with ground beans and rice needs a little help in the scent department. The salt beads in Trillium’s Oil-Free Face Polish weren’t huge, but they weren’t super-fine, either. They took a bit to wash off (compared to other scrubs), which was a nuisance. The ingredients, which include nourishing aloe vera and honey as well as acne-fighting witch hazel, lavender and tea tree, are stellar. However, the texture just wasn’t my favorite. While I love this scrub’s short ingredients list (oatmeal powder, baking soda and salt! ), it left a lot to be desired in the texture department. The oatmeal powder base makes for a mushy concoction that really can’t even be called a scrub. This might be better positioned as a mask than a true facial exfoliant.